A BUBBLING CAULDRON: BYE, BYE, BANNER! CITY: "MR. MONAHAN, TEAR THAT BANNER DOWN!" 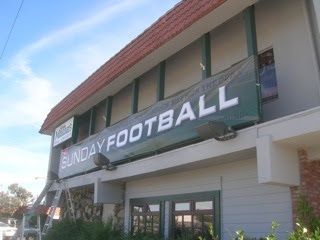 Just in case you were wondering, city officials advise me earlier this week that the "Sunday Football" banner plastered across the Newport Blvd. frontage of Councilman Gary Monahan's pub is, indeed, illegal. A representative visited the site on Monday and measured the offensive banner and found it to far exceed the dimensions permitted by our municipal code. As would be the case with any other such banner in violation, Monahan will be sent a notice to remove the sign no later than next Wednesday. This banner, in my opinion, is just another example of Monahan's arrogance and his abuse of his position in city government. You will recall that he recently requested the City Council to cut business some slack in the enforcement of such offending signs and banners, citing tough economic times. That overture was soundly rejected by his peers on a 4-1 vote. Monahan apparently decided to ignore his colleagues and went right ahead with the banner. He actually complained about their decision again at the most recent council meeting during a discussion of youth group banners, all the while displaying an illegal banner at his gin mill. As I've mentioned before, I fully expect Monahan to resurrect the issue of a directly-elected mayor for Costa Mesa early enough next year that the issue could be placed on the ballot next November. This, of course, would be so he could get himself elected mayor for life and stay perpetually bellied-up to the municipal trough. When he last proposed this move it was without term limits. I guess he sees himself as an emperor-in-waiting - kind of like Idi Amin Dada. The city does not need a directly elected mayor, and certainly not one without term limits. Allowing Monahan to pull that off would be like giving a kid the keys to a candy store, for goodness sake. If he does bring this issue up again it should be summarily rejected as a self-serving, bad idea. "Tear that sign down." I love it. Sounds like Reagan himself. Gary must think that maybe nobody would mind the sign; after all, Gary can wear you down with his charm. But a city ordinance is to be followed by everyone. City officials are not above nor below a law. Thanks for keeping us informed. Hahahahahaaha...sure it comes down as scheduled! He should have hung it at the little league field. Just another reminder... I will NOT publish "Anonymous" comments here, regardless how relevant. Pick a pen name and send in your comments. The Fairgrounds Beat Goes On.. And On..